Sterility and Infertility "Age and Infertility"
It is an undeniable fact that fertility in women declines as they get older. 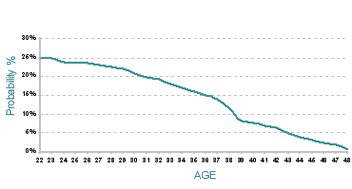 As you can see in the graph below, at around 20 years old women have the best chance of becoming pregnant in a natural cycle, with a probability of approximately 25%. From this point onwards fertility decreases gradually, with a significant drop from around 37 - 38 years of age. As we have already observed, these are average figures. The fertility of some women may decrease earlier, whereas others may remain fertile into their forties. This whole process is linked to the drop in the oocyte reserve, and to a reduction in oocyte quality, which is manifested as an increased number of chromosomal anomalies in oocytes. Why is age so important? It is a widely acknowledged fact that the appearance of foetuses with chromosomal anomalies is much more common in older women, especially those above the age of 35. One of the best known of these is the chromosomal anomaly that causes Down’s syndrome. Chromosomal anomalies contribute greatly to the increase in the miscarriage rate for older women. All of the energy required for cell division and growth in an embryo is supplied by small organelles called mitochondria within the ova. As women get older, their ova contain less and less mitochondria, and as a result the embryo has a decreasing supply of energy for its development, and although it is true that a foetus will produce its own mitochondria when it reaches a certain point of its development, if the embryo does not have enough energy to get to that point it will stop developing, which will result in failure to implant, failure in cell division, or miscarriage. If a woman does not have menstrual periods, or these are irregular, ovulation is usually also absent or irregular. An absence of ovulation will result in total sterility. Ovulation can normally be corrected by treatment with drugs. If the problem is the exhaustion of the ovarian reserve, one solution could be to use donated eggs or embryos.